"We can't all be Amazon goddesses, Miss Yamazaki!" The scene of Bubblegum Crisis is Tokyo in the year 2040, following a horrendous earthquake. The city is beautiful and futuristic after having been rebuilt by mysterious robot workers known as "boomers," that appeared following the disaster. Genom Corporation is the driving force behind the development and spread of boomer technology in the world. However, many people are opposed to using robot slaves to do the manual labor of civilization. To further compound the problem, some of the boomers go rogue and act in a violent and dangerously mindless way. A special police force has been formed called the A.D. Police, whose job is to deal with the maddened robots, but often they are less than successful. An independent group of crusading vigilantes called "The Knight Sabers" has emerged and, using their own technologically advanced armored combat suits, battle these destructive robots where the A.D. Police fail.In the first episode of Bubblegum Crisis, Can't Buy a Thrill, we meet our cast of characters. Linna Yamazaki (Kelly Manison, Rio Natsuki) has arrived in Tokyo to take up her anonymous office job. She meets various difficulties during her first day in the big city, including a near miss by a mysterious young woman on a motorcycle, who causes Linna to drop her lunch. Later at the office, Linna is punished for her disheveled appearance because her impetuous nature led her to chase this motorcycle rider through the parking garage. We also meet an employee of the A.D. Police, a computer expert named Nene (Kiroku Konishi, Hilary Haag) and two of the A.D. Policemen, Leon (Kiyoyuki Yanada, Jason Douglas) and Daley (Yuji Ueda, Chris Patton).While Linna is mopping a floor as punishment, a man who works at Genom asks her out after work. She ends up going with him to a less-than-savory section of the utopian Tokyo. Walking along the street she sees a poster advertising the appearance of a singer named Priss (Yu Asakawa, Christine M. Auten) in a nightclub that she recognizes as the rider of the motorcycle. At the bar where Linna and her date—who turns out to be a company supervisor that likes to harass new female employees—a marauding boomer suddenly appears and soon, so do the A.D. Police and the Knight Sabers.Linna has been curious about the vigilante group since her arrival and announces her desire to join the team. This is a good little introductory episode that is forced to spend much of its time on exposition. Even still, there is quite a bit of assumed knowledge about this future world that makes it difficult to follow at times. However, the reasonably interesting plot obviously lays the foundation for episodes to come.Fragile is the second episode and opens with an analysis by the A.D Police of the capabilities of the Knight Sabers, but obviously there are forces at work about which the cops on the street do not know. Leon and Daley try to figure out where the Knight Sabers come from when they encounter Nene, who is one of the Knight Sabers but works undercover at the A.D. Police using her position to aid the vigilante team's efforts. Linna is having difficulty adjusting to the rules and regulations of her office job. We meet dress shop owner Sylia (Satsuki Yukino, Laura Chapman), the secret leader of the Knight Sabers, as she and Priss, the most powerful member of the team, discuss Nene's contribution to their efforts. Priss is dissatisfied with Nene and has begun to think of Linna as a potential new member. Linna tries to crack into the A.D. Police files on the Knight Sabers, which brings her into contact with Nene.We learn more about the situations and personalities of the characters in this episode. Priss is a taciturn and brooding figure, who only feels alive when she is singing or wearing her Knight Saber combat suit. Nene is a practical joker and the comic relief, but also the computer expert of the group. Linna, the prospective member, is athletic, impetuous and determined in her efforts to join them. Sylia has connections with the highest authorities and has some personal reasons to fight the spread of boomer technology. This episode contains continuing exposition, but has some nice character development and humor.The overall storyline and the action begin to kick it up a notch in the third episode, Keep Me Hanging On, as Linna joins the Knight Sabers over Nene's objections and sees her first action in a "hard suit," the nickname the team has given their combat armor. We meet Nigel, the stoic super-mechanic who works on Priss' motorcycle and also maintains the combat suits of the Knight Sabers. Nigel seems to have something going with both Sylia and Priss that is yet undefined. Also somewhat undefined is what seems to be a relationship between the spreading influence of boomer technology and the number of rogue boomer occurrences. While out riding, Priss comes across a bizarre, destructive boomer and calls back to the Knight Saber HQ, as Linna is being fitted with her suit. With no time to do anything else, Linna is forced to immediately go out on her first mission with no training.This episode is our first cliffhanger and, as such, does not stand alone as much as the first two, but the story of Linna joining the team does. Fortunately, the next episode is contained on this disc!In Machine Head, we pick up as Linna and Nene arrive on the scene of the incident where Priss is trapped with the boomer. Unfortunately, Linna's hard suit malfunctions and in the best boomer battle sequence yet, we see the Knight Sabers in full action, thanks to the inimitable Priss. Only able to express her worry about Linna through anger at their amaterish work, Priss stalks off. Linna follows and we have some interesting byplay between Linna and Priss back at the singer's trailer. Also, in the aftermath of the troublesome experience, we learn more about the motivations of the team members to battle boomers, setting up the episodes to come.There is a nice balance in these four episodes between character development and action, which makes for a satisfying viewing experience for themselves. Of course, the details provided are also essential to the later discs in the series. We have unrestrained anime fun here, with wild settings and intriguing characters. Bubblegum Crisis Tokyo 2040 includes some great animation in that unusual anime style, which includes some scenes that are sublimely rendered alternating with what can only be described as cartoonish aspects. The dialogue is stilted at times with a few translation and reference disconnects, but nothing that greatly detracts from the experience. I had wanted to review an anime disc to see what "this anime thing was all about." 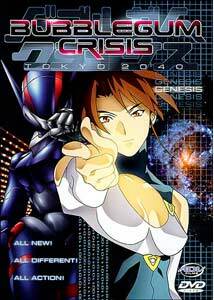 I am pleased to report that I enjoyed the first disc of Bubblegum Crisis Tokyo 2040 very much. It is all great fun. Image Transfer Review: The transfer is very good for Bubblegum Crisis Tokyo 2040. The colors are rich and vibrant with some beautifully contrived detail in the backgrounds. Even in the underground or darkened scenes I saw excellent contrasts. There are some impressive editing sequences that reward the pleasure of rewind and frame advance with some startling artwork. There is a lot going on here! Audio Transfer Review: The original Japanese stereo, with English and Spanish stereo dubs are provided. The rock score is very potent and the sound effects are nicely arranged in the stereo spectrum to give a fullness to the sound. The music of Bubblegum Crisis is one of the best parts of the show and that theme song can really get stuck in your head. Extras Review: Not much in the way of extras with only profiles of the main characters available. Even though sketchy, the profiles provide crucial information for the uninformed viewer. Someone interested in the details of the series might find it useful to visit the ADV Films web site or some of the fan sites available on the Internet for this very popular series. I had hoped for a Priss music video, at least. Four slices of Bubblegum Crisis Tokyo 2040 bear the burden of introducing the many characters and plotlines of the series, but still take time for some good action, humor and music. That makes this an essential disc for the collector. A lot going on in the excellent animation and good fun in the story make this an excellent choice for anyone who might want to pick up an anime disc and see what all the fuss is about.